THE kids' album, with songs for kids of all ages. Irish, Scottish, English, American, traditional, contemporary. Borrow it from your kids and listen to it yourself. 11. Ma, Ma, Will You Buy Me a Banana? Fantastic cd! My daughter loves it! Wonderful for the whole family!!!! 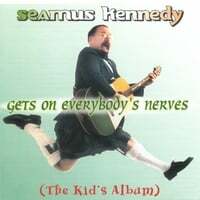 I first heard this CD in a friends car being played for the kids. I loved it!! I am now expecting and wanted to get a copy for my child. This is a very entertaining CD and fun to sing along with. Our 2 grandchildren loved it so we gave it to 2 other families and they both like it too! Another great one! I love the songs so much, I had a hard time sending it off to my neice and nephew, but I know they'll absolutely love it! Thanks, Seamus!! WOW!!! Great music for Kids!!! How wonderful to find a CD with children's green music. My daughter is already learning the words and singing and dancing along. Wonderful! This "kid" of age 73 really enjoyed it! It's a great resource for sing a longs with grandkids! I know most of the words, but when my memory fails me, it's there to help. And the newer generation(s) get right in the spirit and enjoy it as much as I do. Thanks for recording it! a wonderful assortment of songs for school-age children and their adults (not always the case). Lively, with an Irish flavor. Musicianship is very professional. We saw his kids show in Muskegon, MI last summer and finally got the CD for Christmas. It hasn't come out of the CD player since the package arrived! Wonderful! !, and actually doesn't get on my nerves!! It's a great CD that I will use in my classroom for many years after my kids give it up! great!!! bday gift for my mom, exactly what she wanted. Played it for Sis who works for 'youngins' and we will get on a Lot of Nerves, and dogs a howling.